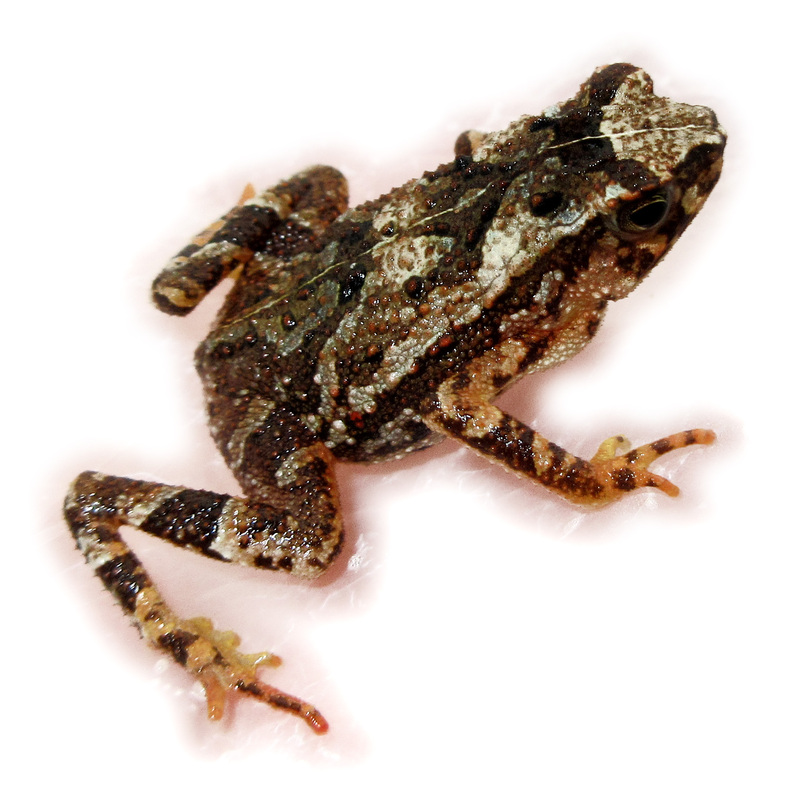 For a small fees and prearrangement, a Tawau Hills Park ranger will guide you around the head quarter area for a night walk to look for nocturnal animals such as frogs, snake, night birds etc. A Night Jungle Walk is the best way to discover nocturnal creatures in the rainforest. 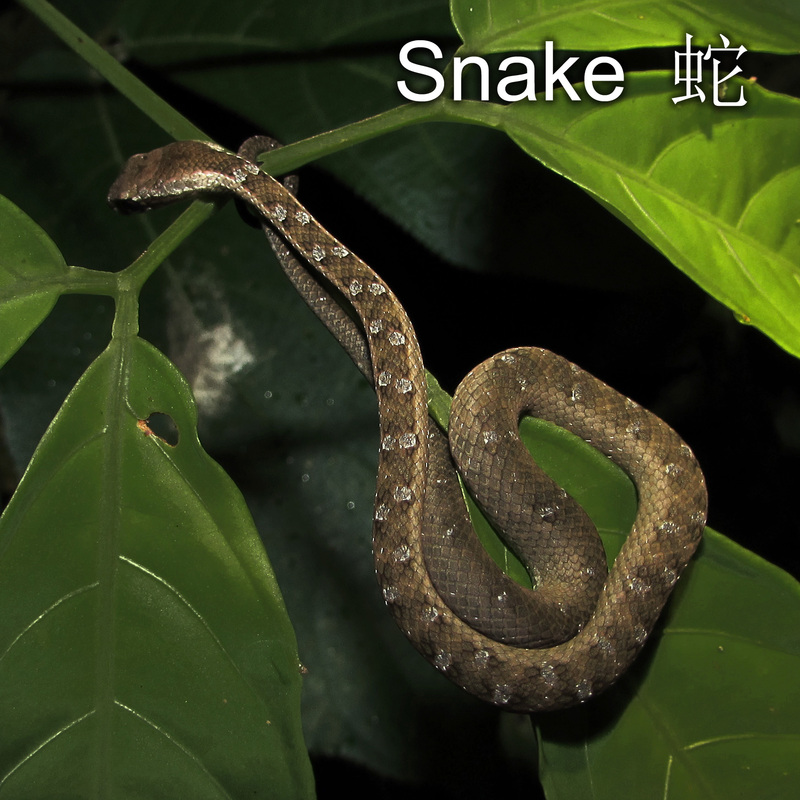 At night, jungle night life comes alive with many of the wildlife only active after night fall. Remember to bring a touch light or headlamp. This is necessary to see nocturnal animals and insects along the trail. Keeping a quite walk when trekking along the trails in order not to scar the creatures away. - Feacture Hornbills, World’s Tallest Tropical Tree. Tawau Hills Park is a 280 square kilometre of rain forestr under First category Conservation Area. 1- The first category is Conservation Areas, for the purpose of fast and flexible protection of wildlife and habitats. 2- The second category is Wildlife Sanctuaries is the strongest conservation category for fauna, flora, genetic resources and habitats. 3- The third category is Wildlife Hunting Areas, intended for animal population management by regulated hunting. Under the First category, Tawau Hills Park is being developed as a field lowland research centre, particularly in tropical wildlife research. Among the facilities constructed are the research exhibits and laboratory building, an aviary (never able to complete) and animal enclosure (with no animal), canopy walkways and observation towers. Currently there are permanent ecological transects and plots and a lowland garden featuring wild orchids and other herbs and plants. Research projects include those on primates and hornbills. There is a canteen selling snack run by KOKTAS. 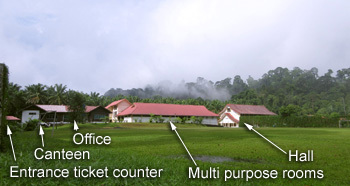 (Sabah parks staffs co-operative). Simple hot foods like noodle and rice are available. This is a small canteen smaller then most the local primary school, so do not expect much. This small café main business is selling cold drinks. Also available hot Teh, Kopi and Teh tarik. There is a soccer field in Tawau Hills Park and a mini hall for court games (sepak takraw, badminton and volleyball) which is regularly used by sabah parks staffs. However, visitor who were keen to use it, please obtain permission from park manager / officer in-charge. 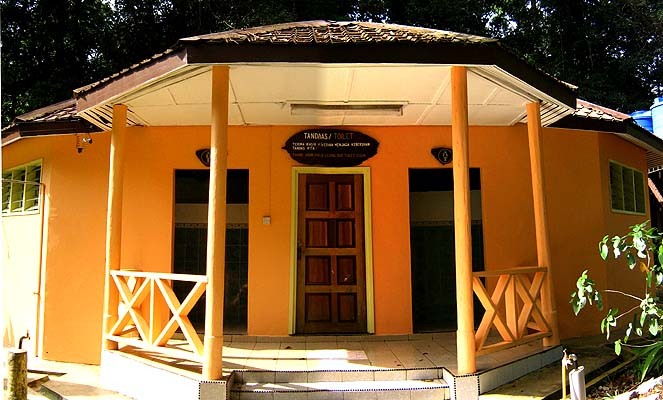 There is a small conference room suitable for meeting/seminar/workshop in Tawau Hills Park. It could be rented out to visitors/public if unoccupied by Sabah Parks staffs. For booking please contact Sabah Parks hq/park manager/officer in-charge. Surau were available for Muslim visitor. 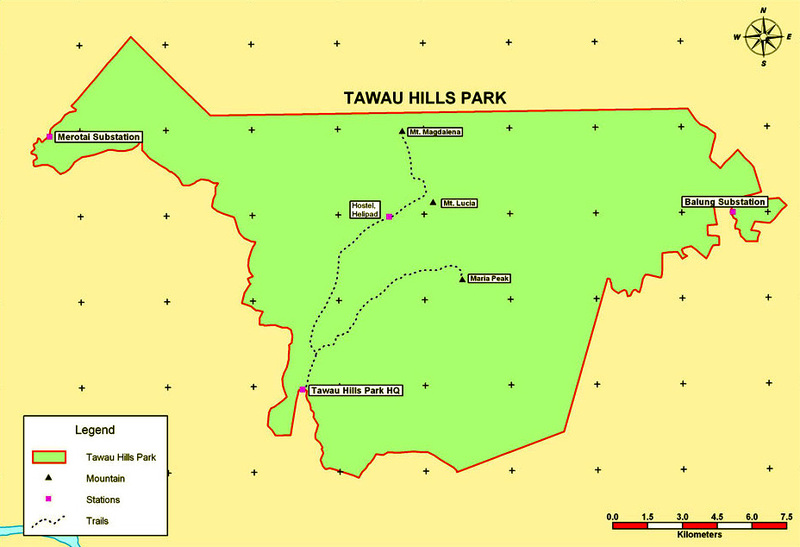 Tawau Hills Park lies 24 km North West of Tawau and was gazette to protect water catchments resources for Tawau Town and the Semporna Peninsula. At least 7 major rivers in Sabah originate here. 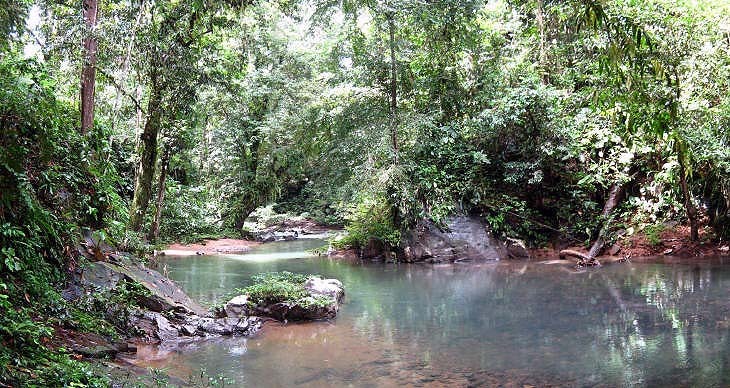 The Tawau River flows through the middle of the 27,972 ha park and forms many natural deepwater pools and waterfalls. The Park Headquarters comprises an office and staff accommodation. 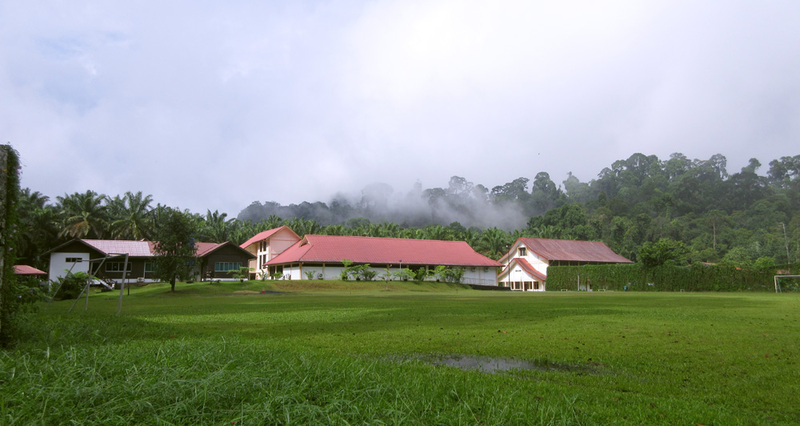 There are chalet, hostel and a canteen operated by KOKTAS, the Sabah Parks staff cooperative. Nature trails lead to a waterfall and hot spring. The terrain is hilly with two prime elevations - Gunung Magdalena ( 1310 meters) and Gunung Lucia ( 1201 meters). Bombalai Hill (530 meters) is a landmark with the remains of a crater. Lowland dipterocarp forest dominates. Above 1,000 meters, thick damp mossy forest takes over. Orchids, epiphytes and forest herbs grow in abundance. The mengaris tree - notorious for its beehives - is common here. Animal life is varied ranging from Long Tailed Macaques and the Red Leaf Monkey to cats, hornbills and pheasants. 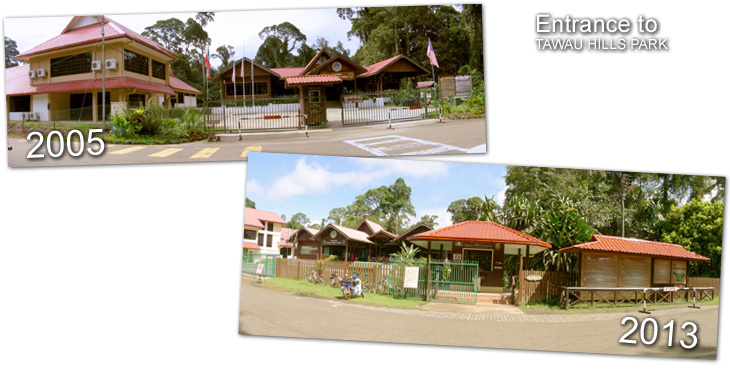 The headquarter of Tawau Hills Park is at the southern boundary of the park and reachable by good road. Those pages in the web still describing the road condition as "a maze of some rather rough roads but that’s part of the adventure !" is outdated for more then 10 years. The new road has been in used for more then 10 years. The distance is merely 24 kilometers away from Tawau Town. But no public bus service is available. Visitors have to make their own transport arrangements to the park by taxi or Grab or through hotel transportation. Those buses you saw parking in front the park entrance are private charted by local people. These local village young people weekly come to the park in bus lots for "parties". Many "sneak through" the entrance gate with out paying entrance fees. The public park ground became a "cigarette smoking heaven" of the youngsters. Officially promoted by government as destiny for International tourists to Tawau. The rivers in the park tumble over several attractive waterfalls, and the Table Waterfall has created a natural swimming pool. Past more spectacular waterfalls, but you need to count two hours of trekking is the Bukit Gelas Waterfall and will pass The Sulphur Spring. Table Waterfall is 200 meters from park main entrance. An easy walk on cemented foot path. This water fall is fenced off from swimming. This is the location where news of local picnickers occasionally swept away by strong water current while swimming. Some were drowsed. 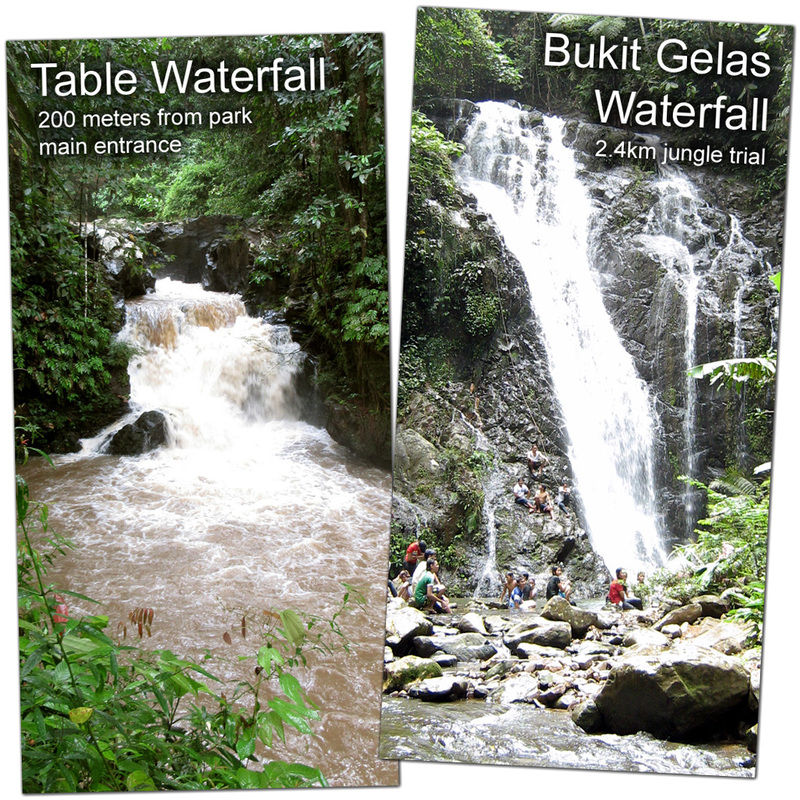 Bukit Gelas Waterfall is an 1 hour walk in 2.4km jungle trial. This is a good place for water funs with clear mountain stream. 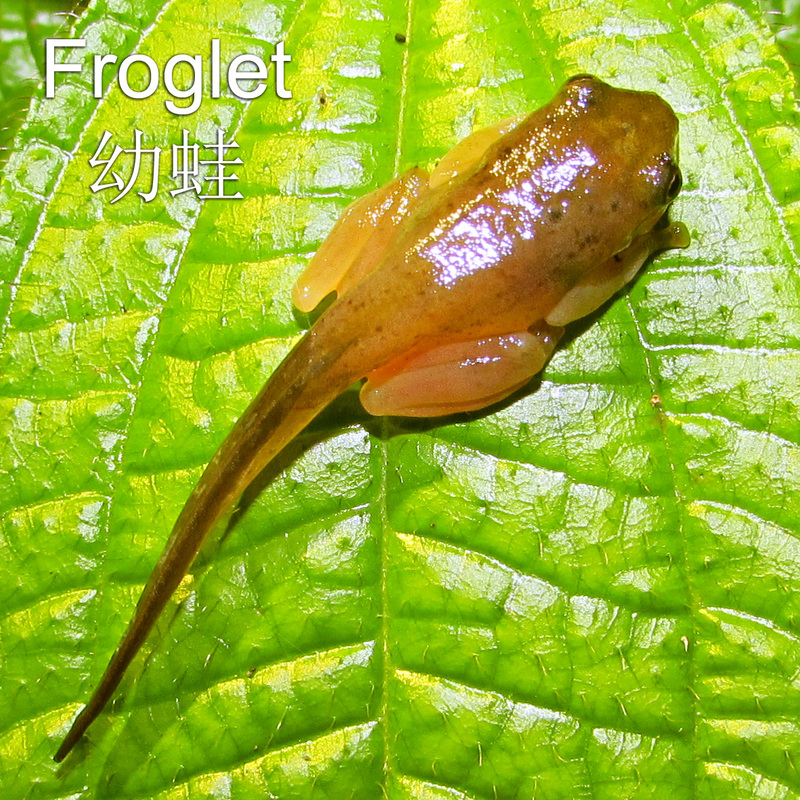 The clear streams are occupied by a variety of small fishes and many frogs whose nightly croaking dominate the evening air. 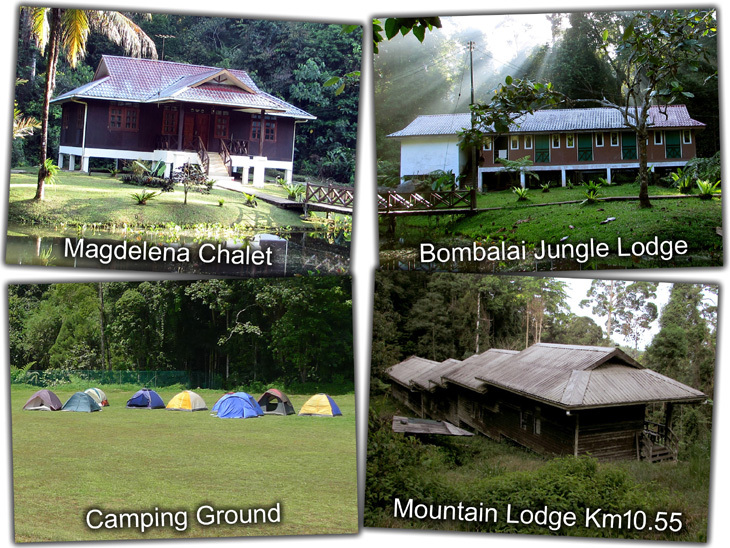 A campsite, 1 chalet, 1 jungle lodge and 1 mountain lodge are available for visitors. The campsite can accommodate 500 to 1000 campers. The hostel is a low cost Rm25.00 per bed ideal for backpackers. So for conform seeking tourists may not expect the service of a 5 stars hotel. Bombalai Hill (530m) is only about a half-an-hour jungle walk. 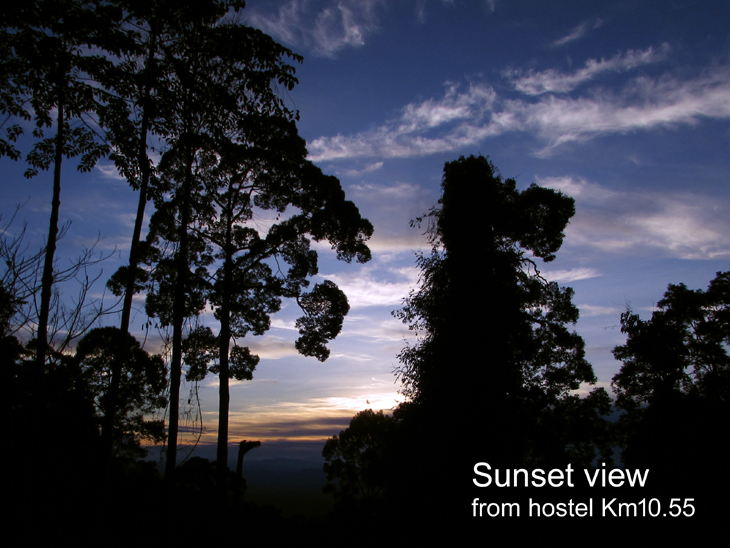 From the hill you have a panoramic view of cacao and palm oil plantations, Tawau town and at the horizon the Sulawesi Sea. Tawau Hills Park is about nature. Nature needs sunlight and nature's beauty shine under sunlight. So choose a sunny day to come. This choosing a time may not be possible for travellers who are passing Tawau on transit or in a tide schedule. Rain can easily ruined your day in the park. Visitors can easily stuck with rain hour or hours. Even after the rain is over, the park is no more an delightful place to wonder around. Outdoor social gathering such as picnic and overnight camping are popular for the local young groups. This is also an excellent location for "Hug A Tree Exercise"
Properly dress for hiking. Walking with shorts and T-shirt only becoming easy targets for leeches. This is a nature park not a city park. Many poor knowledge city people thinking Tawau Hills Park is like their city-parks back home. Coming with poor outfits ruined many of these unprepared visitors. If you are not a adventurous nature lover, going all the way out to a park like this has nothing special interesting enough. But then if you are really a nature lover, a jungle park is a different world of wonders. If you aim is for hiking, Tawau Hills Park offers 2-3 day hikes to distant hills Mount Magdalena, Mount Lucia and Mount Maria. You require a guide (inexpensive). 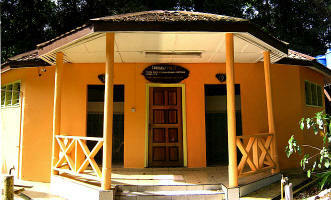 Once you are out of the public recreation area, the only lodge available in the jungle is at 10.5Km. This is the place hikers spend overnight on their way to Magdalena or Lucia. Remember, pre booking is required with the park office. If you do not plan to stay over night but only have a day or half day in the park, then wandering through thick lowland rainforest near by the recreation area will keep you fully occupied for a nice half-day visit. If you are not a nature lovers, Tawau Hills Park is a very boring park. 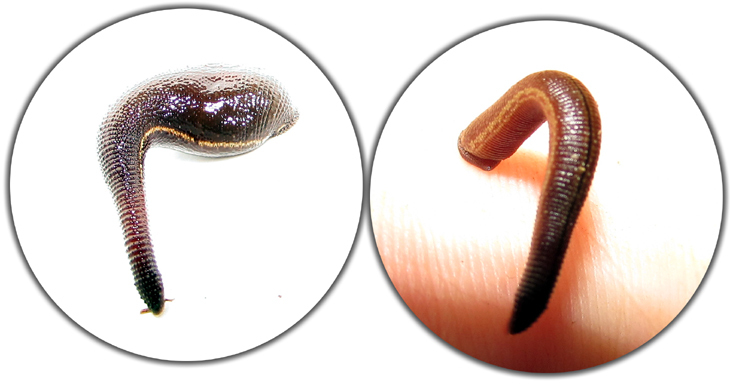 During raining seasons, you may see no wildlife except leeches on your body. Be well prepared for leeches. This creature is what keep tropical jungle parks unpopular for many soft skin tourists. Adventurers and nature lovers are hard skin. For nature lovers, this is a park for discovery. In this rugged volcanic terrain covered natural landscape are hidden with unlimited natural living things. This is a sharp contrast to the neatly cultivated plantations of oil palm, cocoa and rubber you saw on the flat coastal plains. Those who plan to hike up to Mt. Lucia and Mt. Magdanela can expect to spot interesting animals such as Gibbons, red leaf monkeys, hornbills, birds, civits and small wildlife such as scorpions, snakes, spiders. Those do not hike can just enjoy peaceful stay at the only hostel with near by cool stream, canopy walk, a water lily and short jungle walk near by. Going to Tawau Hills Park is difficult if you do not have your own transport pre-arranged. But situation has improved a little with the lunch f GRAB service in Tawau Town since July 2017. With the GRAB application installed in you mobile phone, visitor can easier to get a transport of going now. But remember returning to town is even more difficult. So also confirm with your driver for the returning trip. There is no bus going to Tawau Hills Park which is 24Km from most hotels in Tawau town center. The most common transport visitors get is Taxi and GRAB. Taxi is Rm40 to Rm50. GRAB is near half the price. 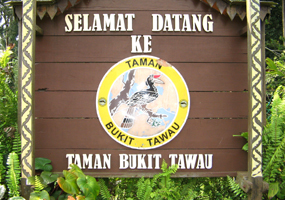 The park headquarters at the southern boundary is merely 24 kilometers (30minutes drive) away from Tawau. Visitors have to make their own transport arrangements to the park which is accessible via a maze of some rather rough roads but that's part of the adventure! Get a taxi or a GRAB from Tawau Town center. A taxi costs us RM 40 to RM50 one way. A GRAB is much cheaper at half the taxi cost. Sometimes you may get a FREE promotion. From the airport, the park is 45 km away and about 1 hour car journey. A taxi from the airport to the park cost around RM 70-80 one way and takes around 1 hour. A GRAB is almost half the cost. But rememb er to make confirmation with drivers for return journey. There is no bublic bus or Taxi stand at the park. During weekdays when few local come to the park with their cars, a visitors may not find any passing vehicles for free rides hitchhikingback to town. You also need to call for a Taxi for you return journey. Or a GRAB which is difficult to get in return journey from the park. Many visitors hitchhike back to town. During weekend when the park is crowded with local picnickers, foreign visitors can find friendly local generously offering a free ride to town. • kill, capture, disturb or remove any animal, nest or eggs. • remove, damage or set fire to any vegetation or any object of geological, historical or scientific interest. • introduce any outside plant or animal. • deface or write on any rocks, trees or buildings. These regulations protect the Park for your benefit, the benefit of your children and for future generations. It is a local habit to close down operation for small matters. So do expect to find the canopy walk is blocked, bird sanctuary is closed and botanical garden is locked for no good reasons. Even the managers themselves do not know when will it be opened again. After 1 week? After 1 months? - Mother Nature's very own spa - the Hot Springs, where you can ease your tired muscles and weary bones while luxuriating in the therapeutic warmth of the 'geo-thermal' pool. The image of Hot Springs (taken 10 years ago) is of the pass. Today, during the dry seasons, the Hot Spring is not more then a ditch of stagnant lukewarm water. Lowland Garden has various wild plants cultivated for display especially orchids, wild ginger and herbs. The garden also showcases some 60 species of ferns including the giant ferns. Being not an attractive garden with too few visitors, do expect the entrance is closed with no staff in attendent. Taman Tanah Rendah (Lowland Garden) Lush dipterocarp forest vegetation and lianas cover the lower regions giving way to thick damp mossy forests as the altitude gets higher and temperatures get cooler. The variety of plant life found within Tawau Hills Park include Agathis, Mountain Ru, Tree ferns, different species of orchids and begonia. Lush dipterocarp forest vegetation and lianas cover the lower regions giving way to thick damp mossy forests as the altitude gets higher and temperatures get cooler. The variety of plant life found within the park include Agathis, Mountain Ru, Tree ferns, different species of orchids and begonia. 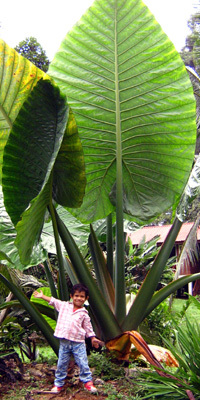 A particularly interesting species is the Mengaris tree whose smooth grey trunk makes it particularly difficult to climb. The 'Orkid Telinga Gajah (Phalaenopsis gigantea) is a wild orchid endemic only in Borneo and in Sabah this orchid species is only found in Tawau Hills Park and Tenom. This orchid is unique as some may have up to six leaves as compared to three and four in other wild orchids. 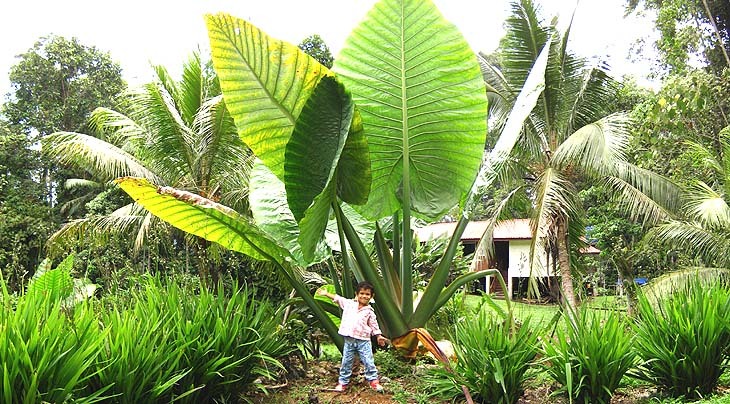 Its flowers would bloom only twice in three years, while the flowers can last up to six months. Lowland Garden has some 200 species of orchids and about 6,000 of orchid plants. Apart from orchids, the it’s also showcases some 60 species of ferns including the giant ferns, 43 species of 'halia hutan' (globa panicoides), wild yam (Colocasia esculenta) and herbs such as 'Tongkat Ali', 'Kacip Fatimah' and incense. In 2014, scientists discovered another tall tree in Sabah being taller then this tree in Tawau Hills Park. Thus it became the second tropical tree in the world. But it still remain the tallest in Tawau town. This world second tallest tropical tree is only 900 meters from Tawau Hills Park's Office. The park has constructed a natural trial for visitor to see this tall tree in Malaysia. Along the trial visitors breath the fresh forest air, view the lush greenery of various plants in this protected forest and, if you are lucky, see the friendly Red Leaf Monkey that live in this protected jungle. Cool Mountain Stream meandering through a lush tropical forest setting and waterfalls cascading excitingly into frothing rocky pools down below, make it an ideal location for picnics and refreshing dips away from the stress and strains of everyday life. Tawau Hills Park lies 24 km NW of Tawau and was gazetted to protect water catchment resources for Tawau Town and the Semporna Peninsula. At least 7 major rivers originate here. The Tawau River flows through the middle of the 27,972 ha park and forms many natural deepwater pools and waterfalls, for example, the Table Waterfall. Before the present sealed road was completed in year 2000, visitors had to passed thought a network of mud roads passing through private oil palm plantations. Today visitor still see oil palm and cocoa fringe the park's boundaries. But rubber trees is of the pass. And the Manila Ham plantations established by the Japanese before the second war has long gone out of trace. The terrain is hilly with two prime elevations - Gunung Magdalena ( 1310 metres) and Gunung Lucia ( 1201 metres). Bombalai Hill (530 metres) is a major landmark. The Park Headquarters comprises of an office and staff accommodation. A simple to follow nature trails lead to waterfalls and hotsprings. Many species of tropical rainforest animals spend their time in the forest canopy. 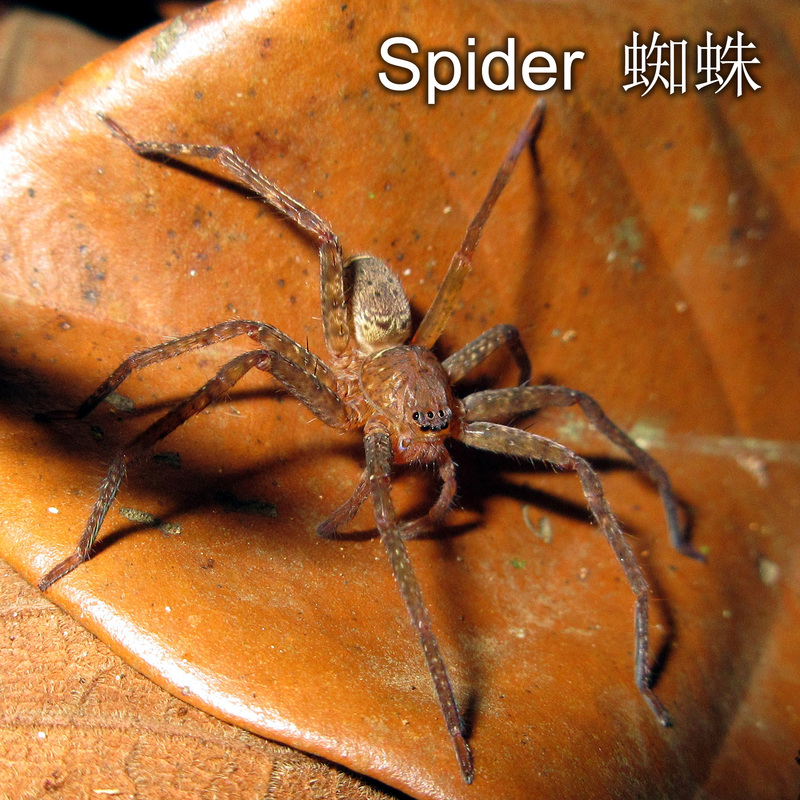 The canopy layer is situated more than 20 meters above the ground and is a convenient natural hideout for many animals. 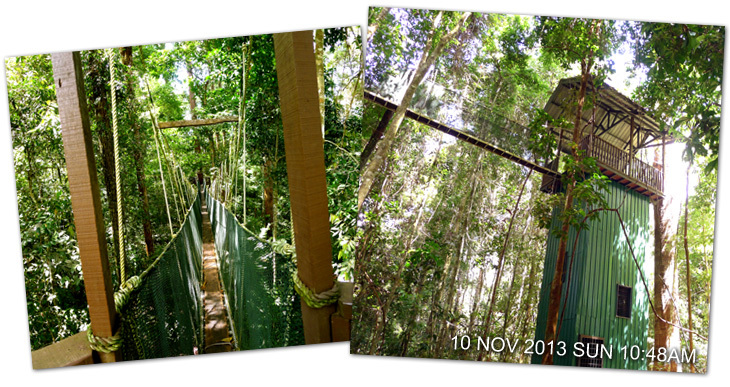 Canopy walkway is the best ways to observe such animals. Animals in the canopy appear less fearful to human compared to when observed on the ground. LOT 3, BLOCK K, SINSURAN COMPLEX, 88800 KOTA KINABALU, SABAH. P.O. BOX 10626, 88806 KOTA KINABALU, SABAH, MALAYSIA. 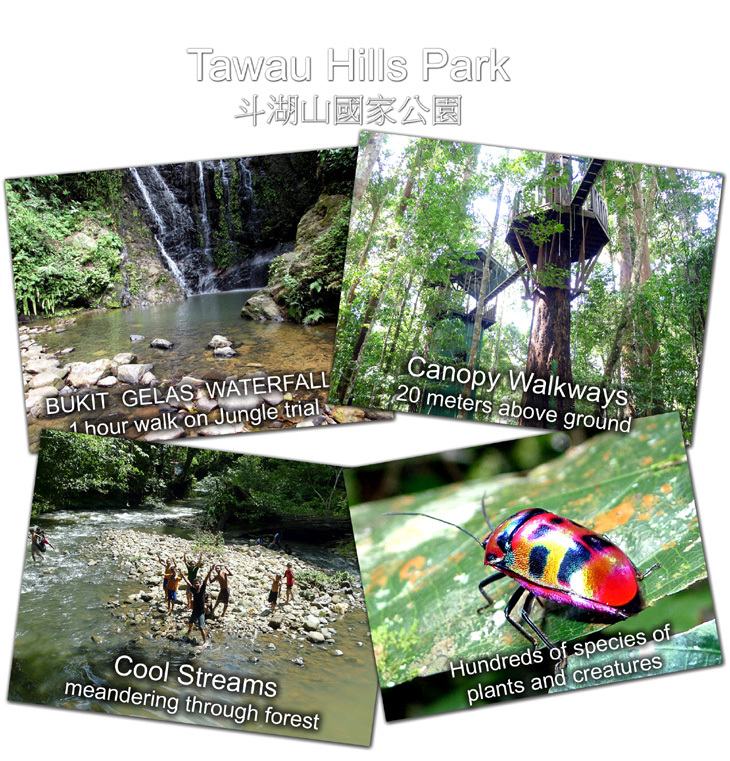 Been to Tawau Hills Park? Share your experiences! ● Logging has been allowed at 150ha of the pristine Tawau Hills Park, which is about the size of Penang island, to make way for Malaysia’s first geothermal power plant. ● The clearing and extraction of 1,639 logs was for the project site located in Sabah’s east coast. ● The logging clearing were also meant for the drilling of seven thermal wells in the area. The logs were also extracted for the construction of roads and laying of pipes involving an area of some 40km. ● The logs had been sold at a loss as the extraction cost was RM475 per cubic meter while they were sold for just RM420 per cubic meter. ● Sabah Government had received some RM340,000 in royalties from the timber extracted from the area. ● Tawau forestry officers had carried out a thorough investigation on claims of illegal logging at the 27,972ha park. “The only source of logs from the Tawau Hills Park was the site which had been cleared for the RM500mil geothermal plant project,” Datuk Sam Mannan said in a local daily. The 30mW geothermal plant is being built by Tawau Green Energy Sdn Bhd, which signed a 21-year power supply deal with Sabah Electricity Sdn Bhd in 2012. 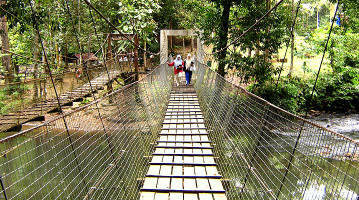 Tawau Hills Park was established in 1979 and has seven major rivers flowing through it. The highest points in the conservation area are the 1,319m Gunung Magdelena and the 1,201m Gunung Lucia. Mother Nature is Earth’s precious treasure we should always try our best to preserve. We must do the very best to protect and preserve the Mother Nature for as long as we can remember. When you visit Tawau , be sure to witness with your very own eyes the protected nature of the Earth -start off with Tawau Hills Park. The local government and local people of Sabah had been trying their very best to protect and preserve the Mother Nature for as long as we can remember. When you visit Sabah, be sure to witness with the effort the local government and the local people poured in to protect this nature of the Earth. 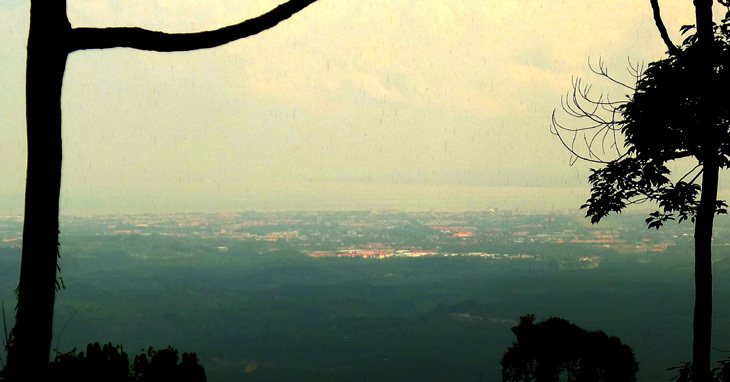 The one place which you can start off is the Tawau Hills Park, located in Tawau. Upon reaching the place, you will find yourself being instantly immersed in a very green environment which will make you feel even closer to the nature than you usually are. Breath in the fresh air and smell the freshness of the green plants surrounding you. This is a chance you will not obtain often, judging on the fact that you always spend most of your time in the big city with the huge buildings and busy streets distorting and blocking your view of the beautiful nature. Here, you can start off by having a picnic session in the park in which you can grab the chance for more bonding session with your love ones; or you can also camp in the park to be further immersed in the green environment while obtaining a thrilling experience of spending the night out with the wildlife. If you are interested with the different flora species in Sabah, the Tawau Hills Park is also the perfect place for you to venture in. You can find a lot of labels as you explore the park, which helps you in enhancing your knowledge on the plant species being preserved in the park. Here, you can even get the chance to witness some rare flora species such as the Elephant Ear’s Orchid which you would not get to see elsewhere. 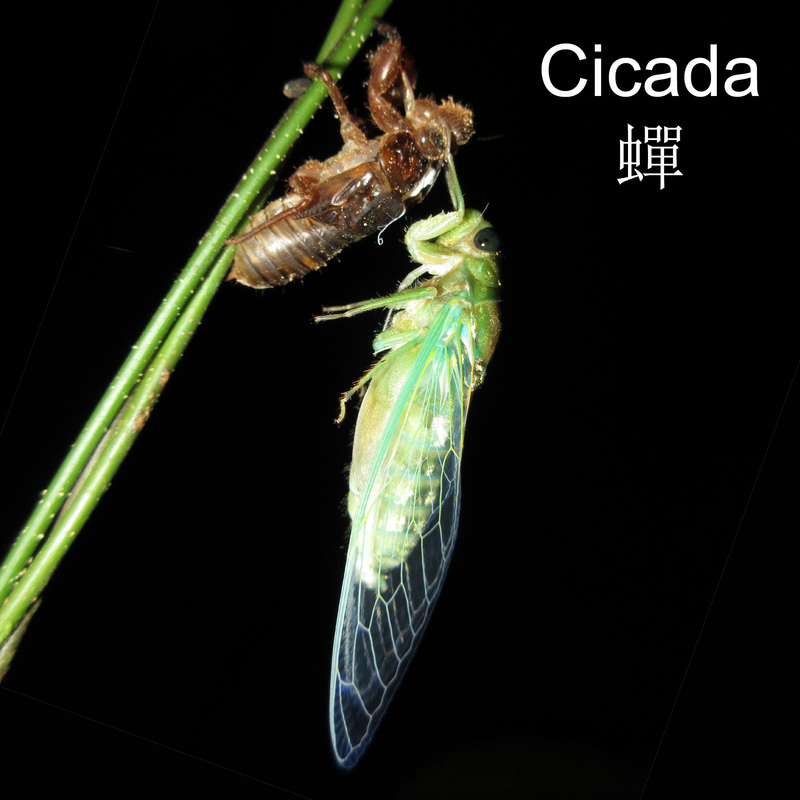 Various fauna species also stroll around the place. It would not be surprising for you to catch a glimpse of the giant tree squirrels, and even various monkey species when you are exploring the park. 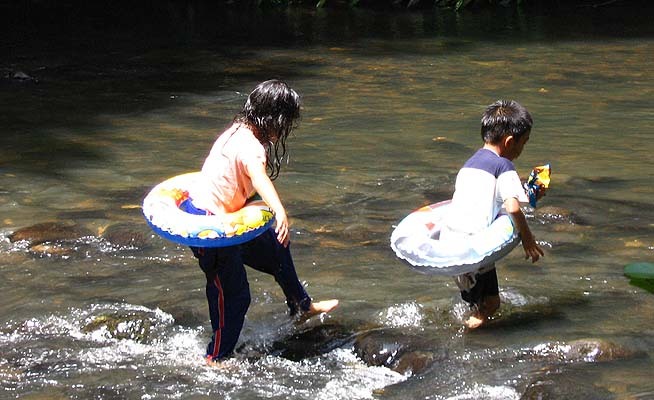 There are also clean rivers in the park for you to have a good swim which you can wash away your tiredness and sweat after a good day of exploration in the park. Walking on the mountain trial you may be allured by the sound and sight of cool mountain streams that tumble downslope as frothy waterfalls and cascades. Sabah's tropical frequent rains results in streams that flow consistently throughout the year. Where layers of hard rock occur and water unable to cut downward to the same extent they have in softer surrounding rock, the result is often a sharp precipice and a waterfall. Throughout Tawau Hills Park each valley has a system of branches, streams and rivers that provides natural beauty and pleasures. This is an nursery rhyme I learned in primary school from my American Peace Corps English teacher many many years ago. Today as I watched this water gently flow downstream and ponder the past, life is indeed but a dream. There is nothing very special at the entrance of Tawau Hills Park. 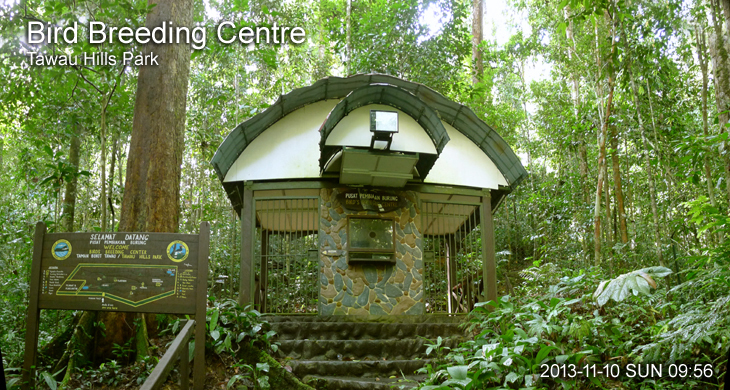 To see the real Tawau Hills Park you will need to jungle trekking into the forest to see the beauty of this place. From Tawau town, take a cab of 30 minutes drive to get there. Entering this park is actually walking into the oldest virgin forest in the world. In a good day you might be lucky enough to see some small animals in the jungle. 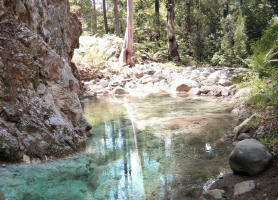 After trekking of about 1 hour you will arrive Hot springs in this park. Or just less then 30 minutes walk you come to touch with your own fingers the Tallest Tropical Tree of the world -- and tie a wish ribbon with a wish. Tawau Hills National Park is located in south-eastern Sabah and is bounded by the Ulu Kalumpang Forest Reserve on the northern side and Mount Andrassy Forest Reserve on the south. The eastern and western sides are bordered by agricultural lands mainly cocoa and oil palm plantations. Both Gunung Maria and Gunung Magnalena are off-limits to the public, but a jungle trail is being constructed to Gunung Lucia for hiking of the public. 7) Sungai Junap (a tributary of Sungai Merotai Besar) in the west. After Tawau Hills Park, one can further venture to Maliau Basin- the lost world of Borneo. Be well prepared mentally and physically to take up this challenge. This is one of the few remaining areas virtually untouched by man - not just in Sabah and Malaysia, but in the whole World!. Cool streams of mountain water meandering through a lush tropical forest and waterfalls and into .......... our drinking cups. The water we drink in Tawau comes from here. The lush area of 27,972 hectares forests of the Tawau Hills Park serves as an important water catchments area for Tawau and Semporna. 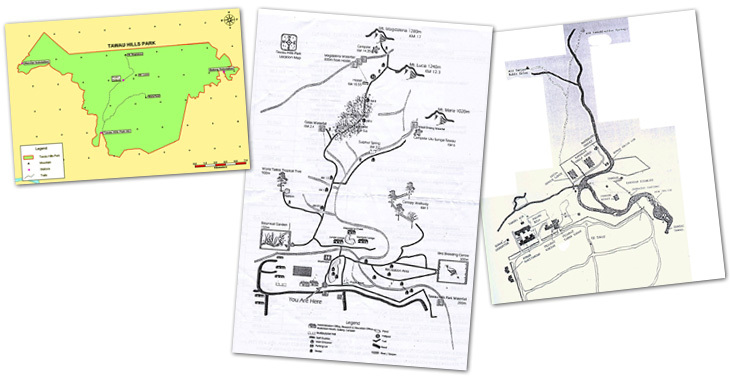 The area was gazette by Malaysian Government in 1979 as a National Park to protect the natural environment with its unique flora and fauna and to ensure an uninterrupted water supply for the region. This park is the water catchments area for five major rivers in Tawau - Sungai Tawau, Sungai Balung, Sungai Merotai, Sungai Kalumpang and Sungai Andrassy. This makes Tawau Hills Park the main water supplier to three districts in the Sabah's East Coast - Tawau, Semporna and Kunak that have almost one million population. The source of life giving water of one million people comes from here. So PLEASE do not destroy our forests. While the open space in recreation areas are not common with leeches, they are plentiful in the jungle. Those going for a jungle hike, beware of the leeches. Though they are "harmless" other then just sticking on your skin sucking your blood without any of your feeling. Unlike mosquito, leeches can stick on you skin for hours. They are every where during rainy days in the jungle trails. On the ground, on the trees, on the leaves. Leeches inject our skin with an anesthetic so that we are not feeling these unwelcome hitchhikers on our skin, an anticoagulant that prevents the blood from clotting, and chemicals that prevent the blood from decaying. But the good thing of Tawau Hills Park is that there are no mosquitoes. Mosquitoes spread disease. Leeches do not. 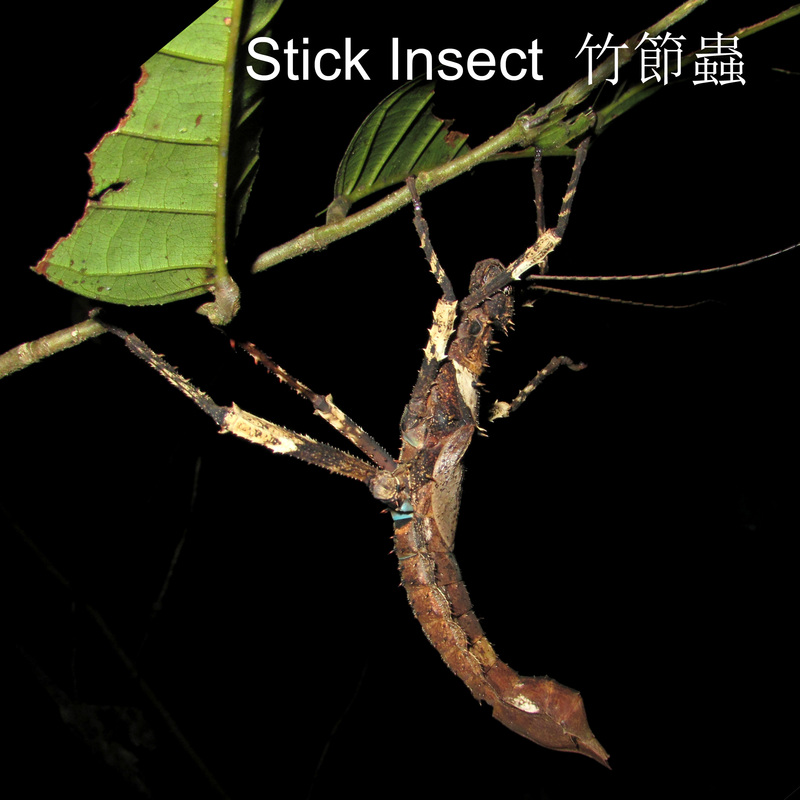 There are no mosquito is because of the well developed nature ecology of the forest. Mosquitoes breed well only in human dwelling areas such towns and cities. 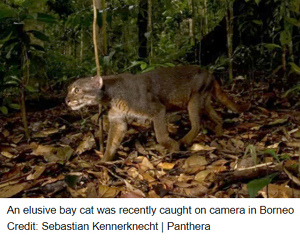 In 2013, Sebastian Kennerknecht visited Tawau Hills Park and teamed with Andrew Hearn in obtaining this first high resolution photograph of the endangered Bay Cat on Borneo by using custom digital SLR camera traps. The picture and corresponding article were then circulated worldwide via LiveScience and Yahoo news, among others. Macaques, creamy white leaf monkeys, giant tree squirrels, civet cats and leopard cats inhabit the park's dense primary forests. Borneo's largest wild cat - the clouded leopard, though rarely seen is not uncommon. It preys on smaller mammals such as rats and even bigger wild pigs. Other inhabitants of the harmless kind include hornbills and pheasants and the slow-moving forest tortoise. 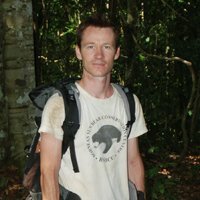 Dr. Andrew Hearn has been studying Bornean wildcats for several years and is the leading expert on Sunda Clouded Leopards and the Borneo Bay Cat. He conducted, 2008-2014, his field research in Tawau Hills Park for his PhD, studying multiple aspects of the ecology of the felids including population size, density, habitat preference, habitat use and prey base. 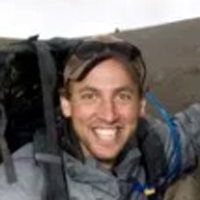 In Tawau Hills Park, Andrew Hearn runs a camera trap survey partially funded by Sime Darby Foundation, as part of Clouded Leopard Programme. For adventurous hiker there is a 14 km jungle trail to the highest peak in Tawau Hills Park at Mt. Magdalena. The walk meander through the lowland forest and lower montane forest. 3 days is required for Route A (two mountains) climb. The Mountain Trails are major highlights of Tawau Hills Park. For those who are healthy and fit, the trails is an satisfying and achievable climb. You may need at least two days 1 night for one mountain climb. Make sure to equipped for wet and cold weather. Climbers are required to register at the park office for the climb and a guide is compulsory. If needed, porters are available at a fees.